This Premier 70 X 130 Ultimate Party Tent is famously designed by Ohenry with complete set-up instructions (including an Installation Video) and 1 Year Manufacturer's Warranty. Top is sturdy with 2 Inch Webbing around the entire perimeter and Guy Ropes attached. See drop down box above to select from a variety of Stripes or choose Solid White for your Tent Top. Poles are made of galvanized steel for light weight durability. Properly installed, this tent is designed to stand up against 75 MPH gusts, though discernment must be used in all severe weather situations. 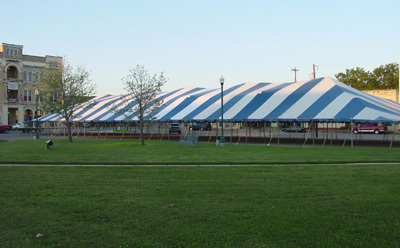 Additional Panels can be added to expand the seating capacity of this Party Tent - Pole Tent, and Side Panels can be purchased (pictures below), each for an additional fee.